I own a single-family home. If this amendment is approved, will my property taxes increase? SB 2922, which authorized the proposed Constitutional Amendment, uses the terms “investment real property” and “surcharge.” Earlier versions of the bill defined “investment real property” as properties which did not qualify for a homeowner exemption, valued at $1 million or more. However, this language was removed from the bill, leaving the term and the surcharge amount undefined. Merriam-Webster’s dictionary defines “surcharge” as an additional tax, cost, or impost. The Legislature will now have full discretion in determining what qualifies as investment real property and the rate of the additional tax. Arguably, any real property is an investment. With that said, even if the additional tax is not applied to primary residences owned by local families, real property tax rates may still be impacted. Maui County garners 77 percent of its general fund revenue from taxes on real property. If the state taps into our primary revenue source, the county may be forced to consider raising rates from other sources. Will county services like fire protection and senior services be impacted by the surcharge? Property taxes fund an array of county services such as fire protection, police, pools, parks, senior services, economic development, social welfare programs, and emergency management during natural disasters. If the state increases property taxes, county services may be adversely affected, and county-funding priorities may need to be reevaluated. The county’s bond rating may also be impacted, which could impede borrowing for infrastructure projects. Currently, the county funds educational initiatives, including after-school activities and transportation for extracurricular programs; vocational training and opportunities; and in-school clubs and activities, just to name a few. The county also provides a wide range of facilities countywide for educational and athletic events such as Wells Park, War Memorial Gym complex, and Kokua Pool. The availability to fund these initiatives and the upkeep of our facilities may also be adversely affected by the surcharge. Will the amendment guarantee higher teacher salaries and better programs for our keiki? Proponents of the measure promise monies will be used to support our teachers, increase public access to preschool, lower class sizes, improve special education, expand vocational and arts courses, and provide Hawaiian cultural instruction. We all support these opportunities for our keiki. However, the language of the bill does not require funds to be used for these purposes. The vagueness of the measure raises red flags. Teacher salaries are determined through a collective bargaining process. Simply passing this amendment would not guarantee higher teacher salaries or benefits. The bill also does not require a net increase in funding for the DOE, but rather, just affords the Legislature the power to collect local property taxes. With a current budget of $1.99 billion, the DOE should also evaluate internal efficiency to ensure our teachers are appropriately compensated, classrooms are air-conditioned, and students are receiving high-quality educational opportunities. * Riki Hokama is chairman of the Budget and Finance Committee. He holds the council seat for the Lanai residency area. “Chair’s 3 Minutes” is a weekly column to explain the latest news on county legislative matters. 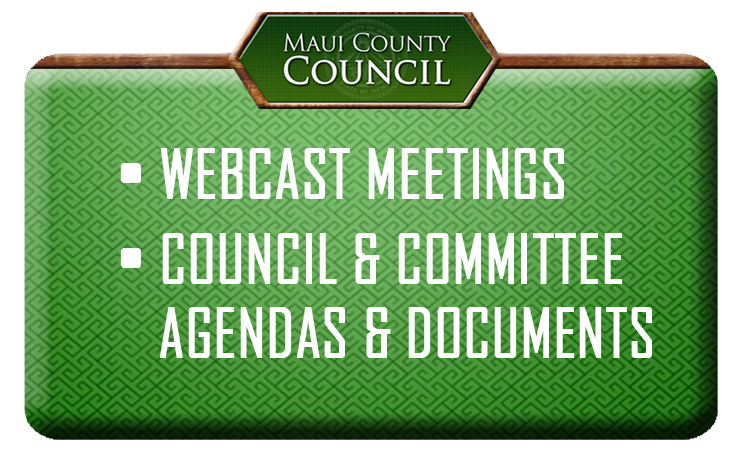 Go to mauicounty.us for more information.